WARNING – Do not expose work area to fire or spark. Do no smoke while performing this work. Clean up all fuel spills immediately. Work in a well ventilated area. 1. 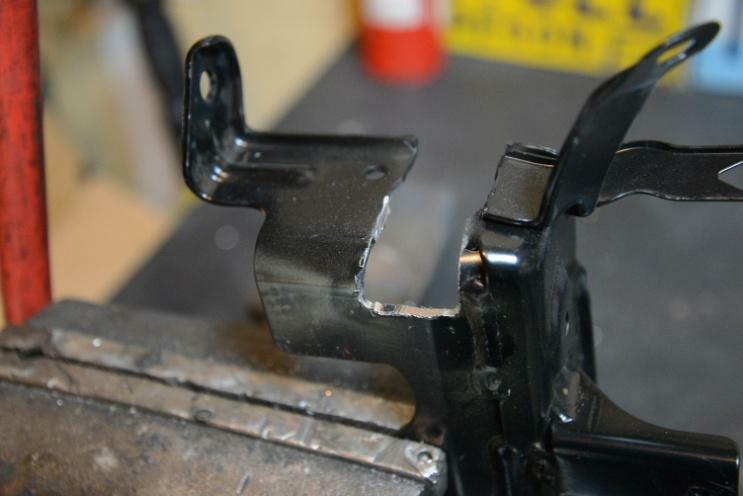 For easier access to the work area, remove all strut bracing; OEM and/or aftermarket. 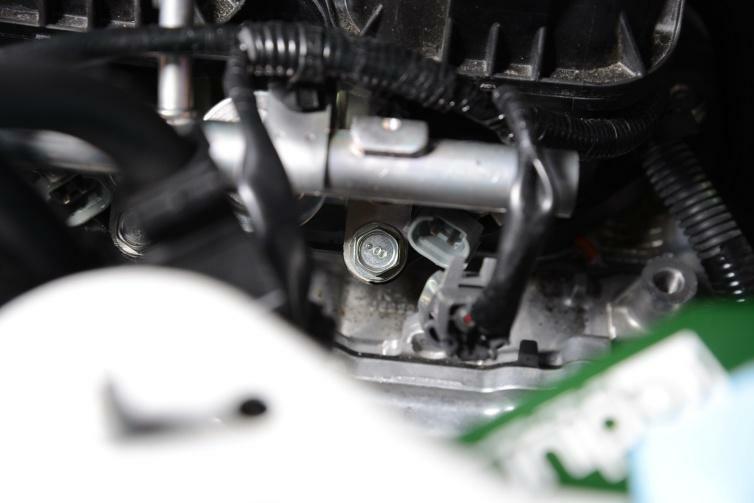 Remove the LH fuel rail cover by removing the two M8 bolts holding it in place. The first bolt is located toward the front of the cover. 2. The second bolt is located toward the rear of the cover. 3. 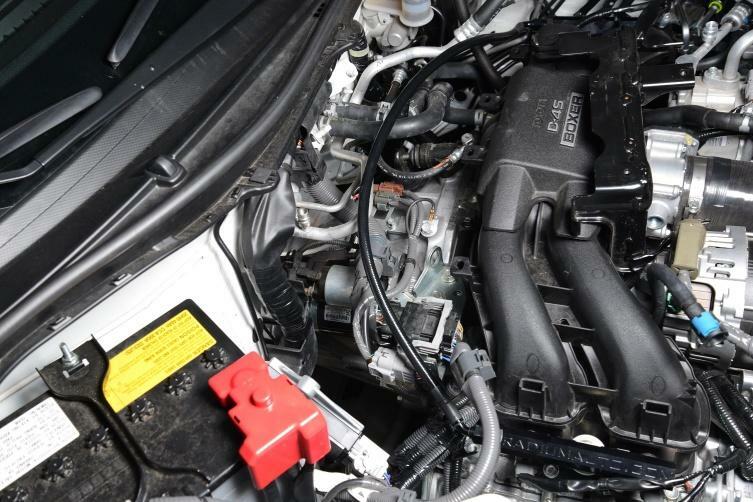 Carefully lift the cover out of the engine bay. 4. Locate the crossover fuel hose connection on the front of the LH fuel rail. The hose end fitting has a blue clip. Pull the blue clip upward to unlock it, as shown. It may help to release the lock tabs on the bottom while pulling up. 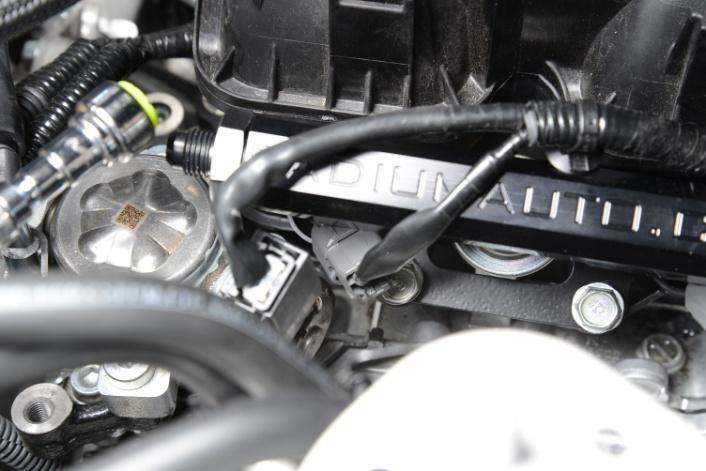 After it is unlocked, slide the crossover fuel hose off the fuel rail pipe. Some fuel will drain out, be prepared. 5. 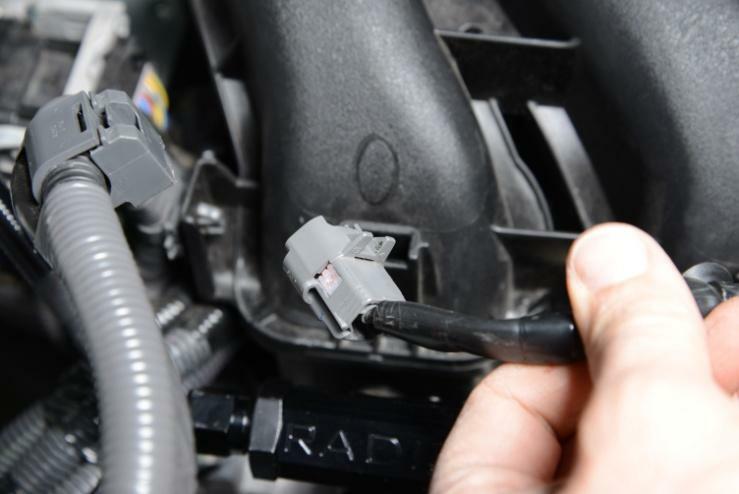 Use the white plastic fuel line release tool included in the kit to detach the fuel feed hose from the fuel rail pipe. 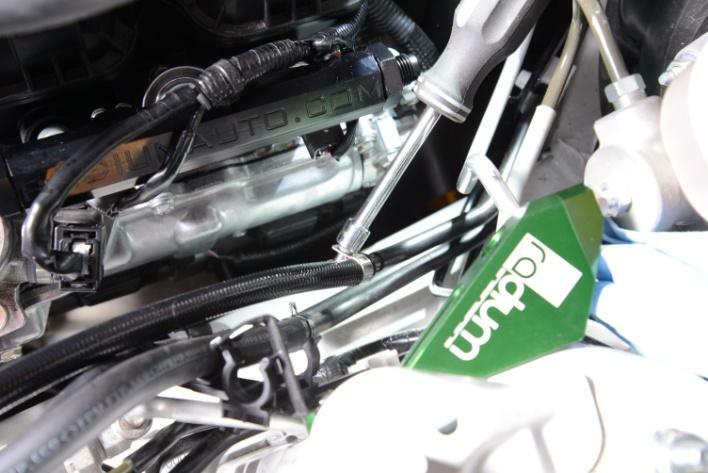 Insert the white plastic tool between the green plastic collar of the fuel hose and the metal pipe of the fuel rail. Push the plastic tool in as far is it can go. It might be necessary to use pliers to insert it fully. 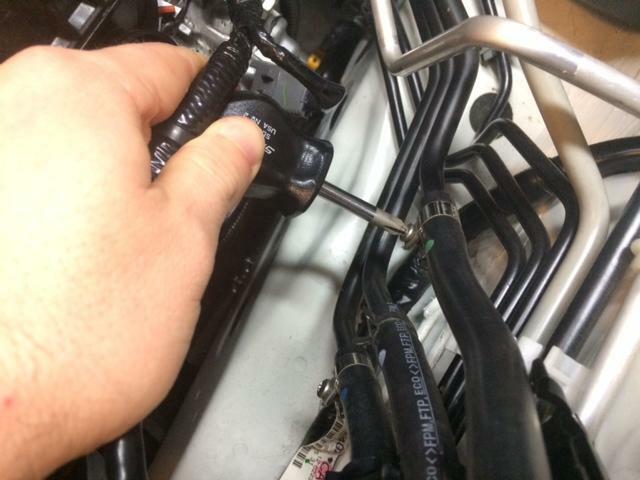 While inserting plastic tool, push the fuel hose further onto the fuel pipe. The hose will release from the pipe given enough effort and patience. Some fuel will drain out, be prepared. 6. 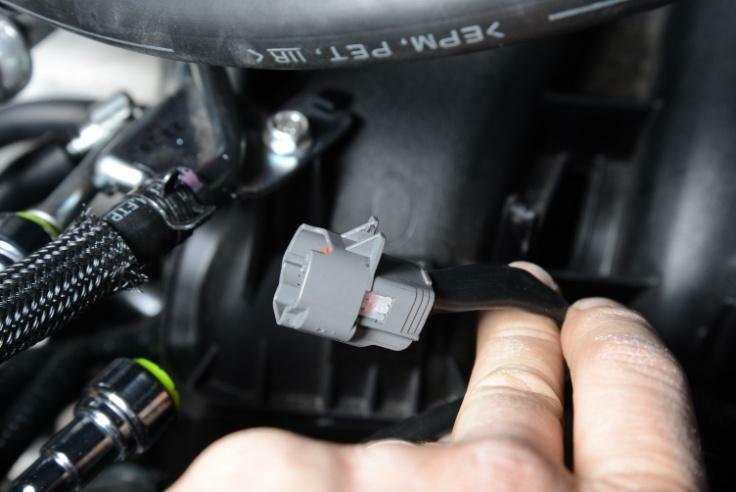 Unplug the electrical connectors on each fuel injector. 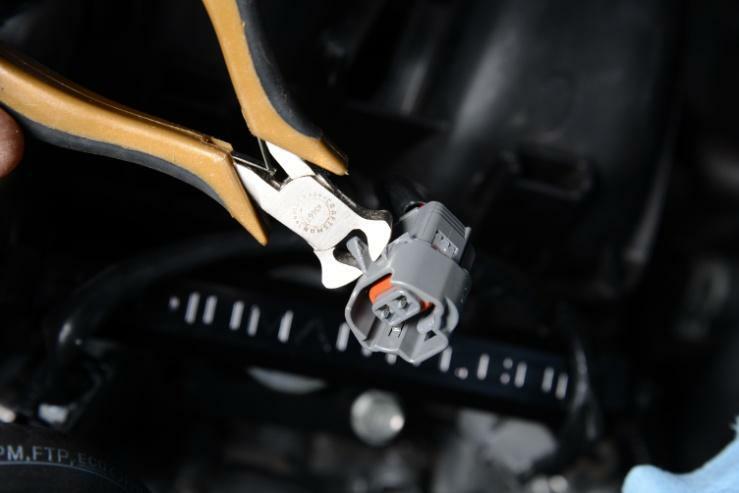 Unclip the wire harness retainer from the fuel rail tab. 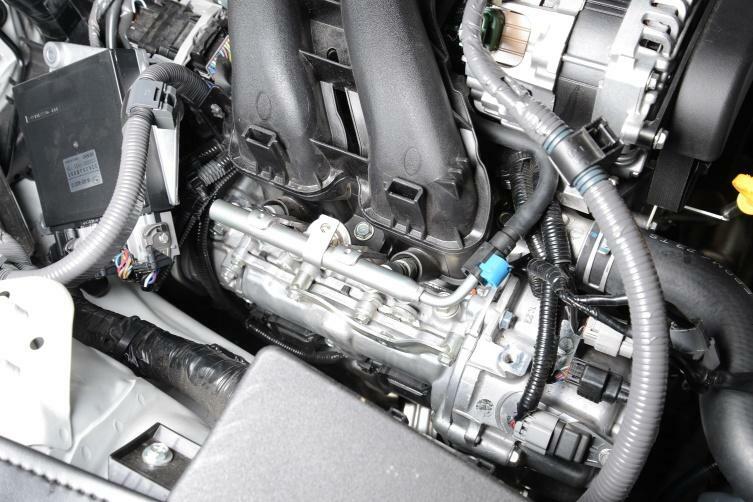 Remove the two M8 bolts holding the fuel rail to the intake manifold. The fuel rail and injectors can now be removed. More fuel will spill out, be prepared. 7. With fuel rail out of the car, remove the injectors. 8. 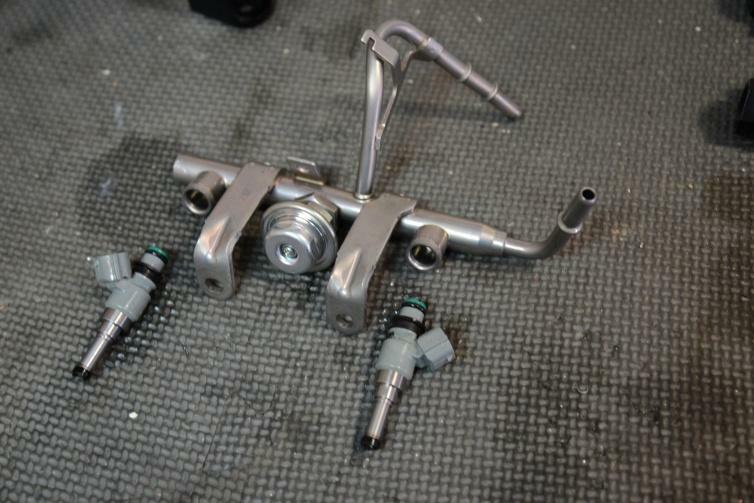 Secure the fuel rail in a vice and remove the fuel pulse damper using a 7/8” or 22mm wrench. 9. The damper and it’s sealing washer will be re-used on the Radium fuel rails. 10. 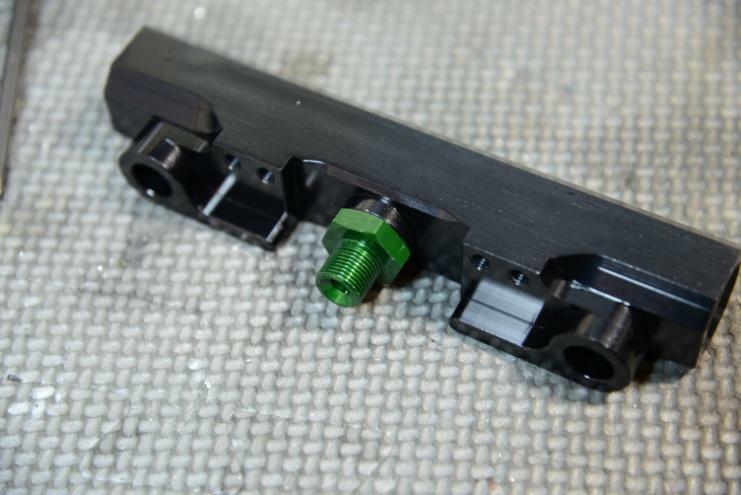 Install the fuel pulse damper adapter into the center port of the Radium fuel rail. Make sure the side that screws into the rail has an O-ring on it. 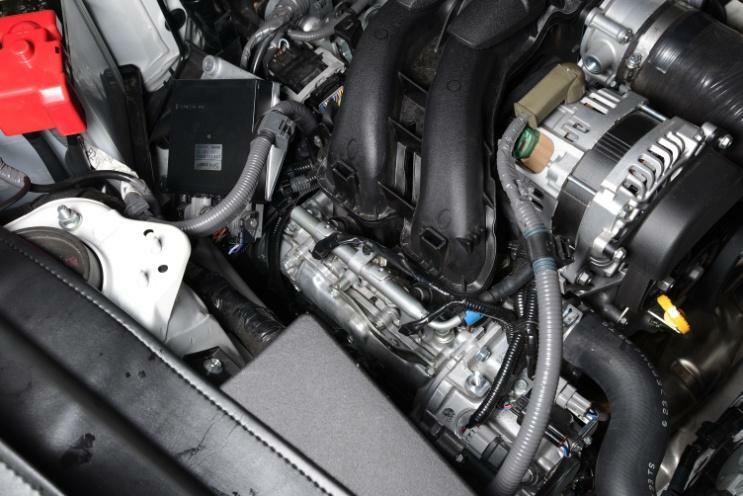 NOTE: If not using the pulse damper, you can use the center port for plumbing of accessories or alternate fuel routing. 11. Place the crush washer from Step 9 on the adapter fitting then screw on the pulse damper. Tighten with a 7/8” or 22mm wrench. Install the mounting bracket using the screws and lock washers included in the kit. 12. Install the fuel injectors by pushing them into the ports. Make sure the O-rings do not get pinched while doing this. Install the -6AN adapters into each end of the fuel rail as shown. Make sure the fittings have O-rings on them before installing them. 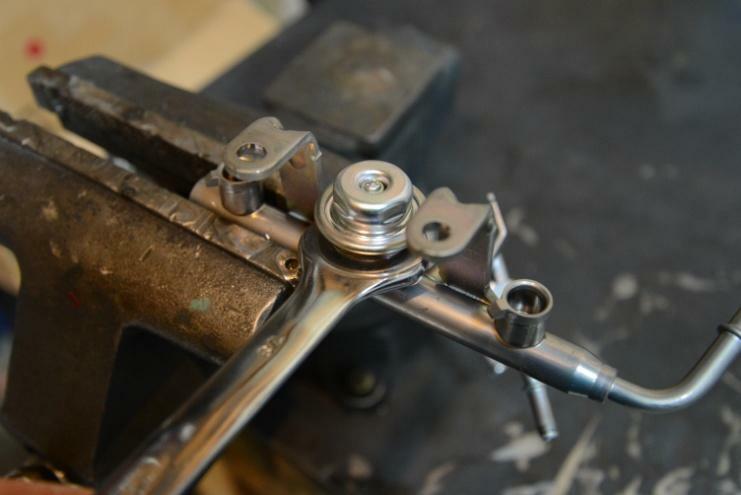 Hold fuel rail in vice with non-marring jaws, and tighten the fittings with a 1" non-marring wrench. 13. 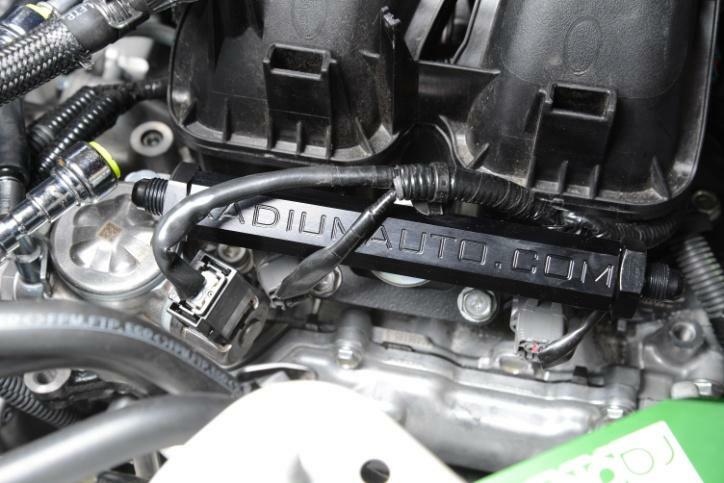 Place fuel rail in position on the intake manifold. Do not fasten it down yet. 14. 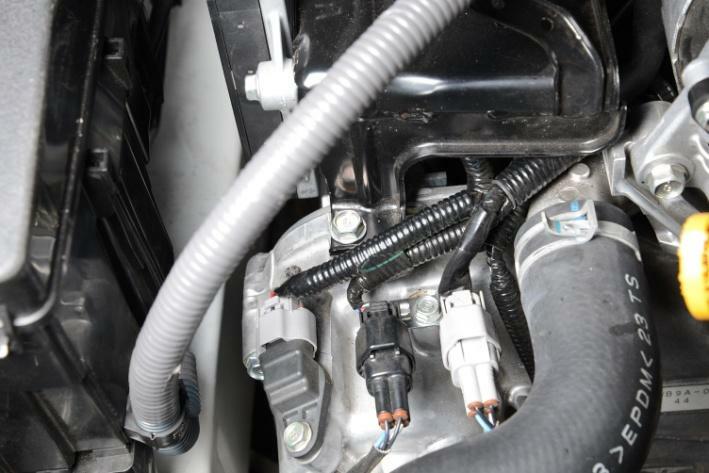 Locate the electrical connector for the #2 (front) injector. 15. Use some small cutters to snip off the “rabbit ears” on the top of the connector. 16. The connector should then look like this. 17. 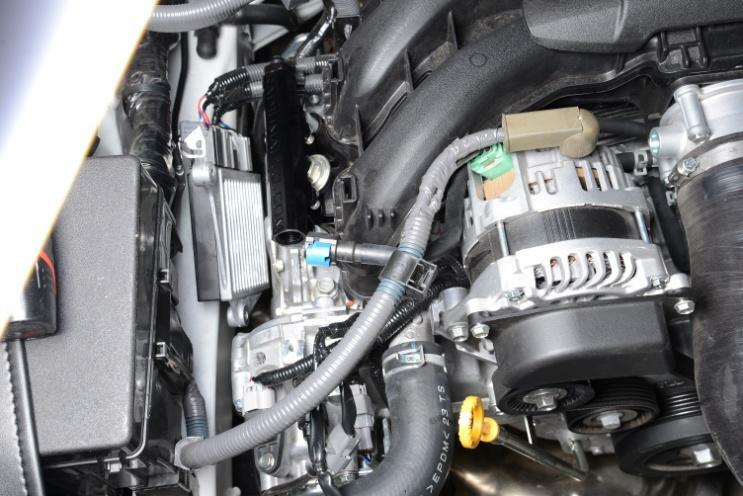 With the fuel rail not yet bolted down, install the #2 injector connector onto the injector. You can now begin to seat the fuel rail down into place. 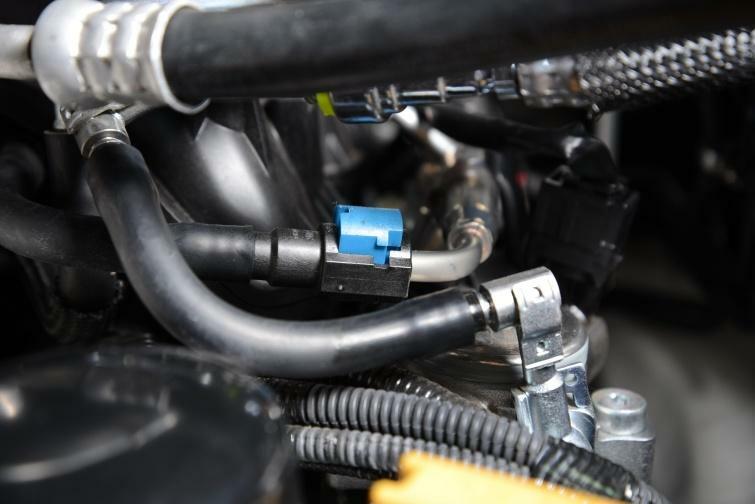 Orient the #2 injector so that the electrical connector clears the high pressure fuel pump. Reuse the factory M8 mounting bolts. 18. Tighten both mounting bolts. 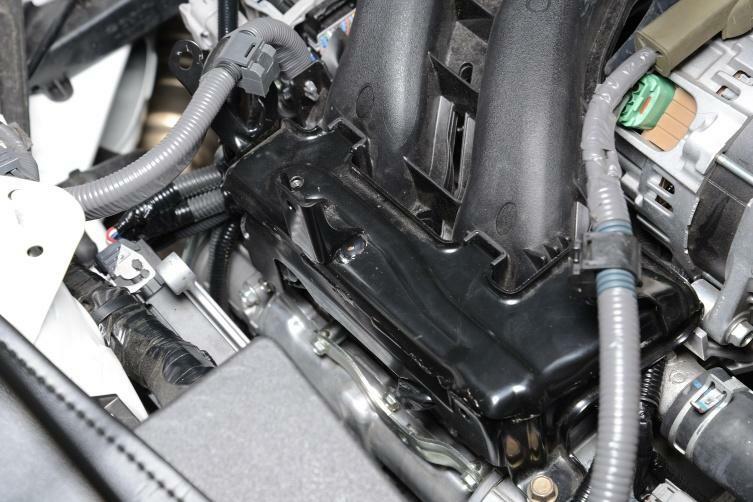 It will be necessary to use a flat wrench on the front bolt (near the #2 injector) because the electrical connector will be in the way of a socket wrench. Plug in the rear (#4) injector. 19. 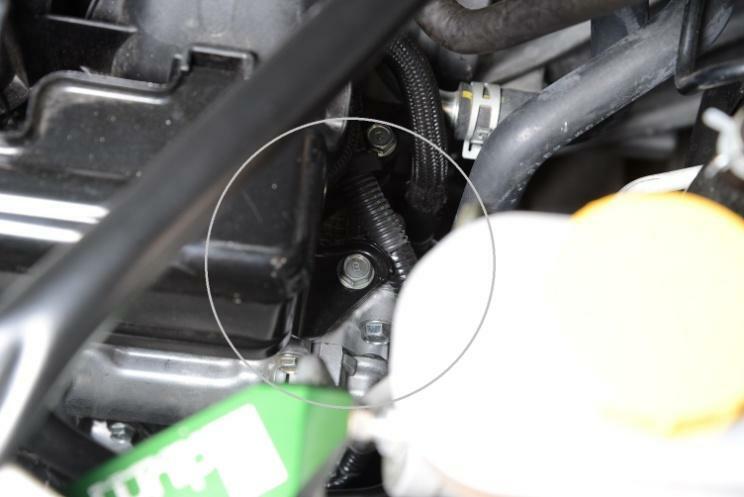 Use a short Phillips head screw driver to loosen the hose clamp on the fuel feed line, the one that was disconnected in step 5. Pull the hose off the fuel pipe. This hose and clamp will not be reused. 20. Find the PTFE hose included in the kit that has a 90 degree fitting on one end and no fitting on the other. 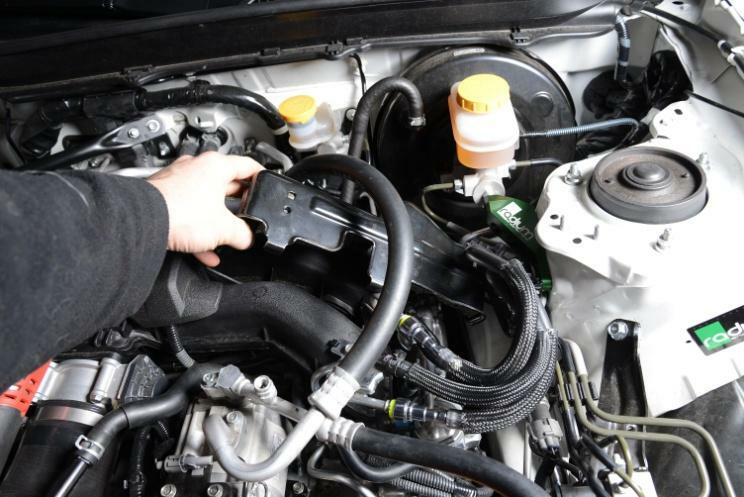 Install the hose clamp included in the kit onto the end that does not have a fitting. 21. Push the PTFE hose onto the fuel pipe from step 19. Do not yet tighten the hose clamp. This will allow the hose to rotate on the pipe. 22. Connect the other end of the hose to the LH fuel rail front port. 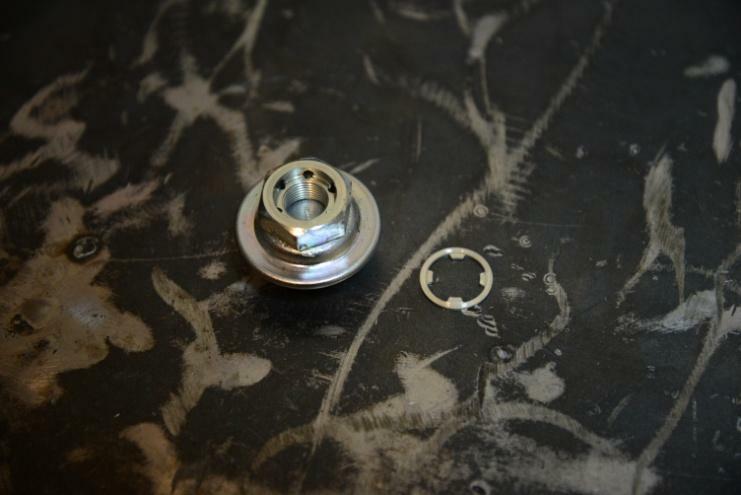 Secure the B-nut using a non-marring wrench. 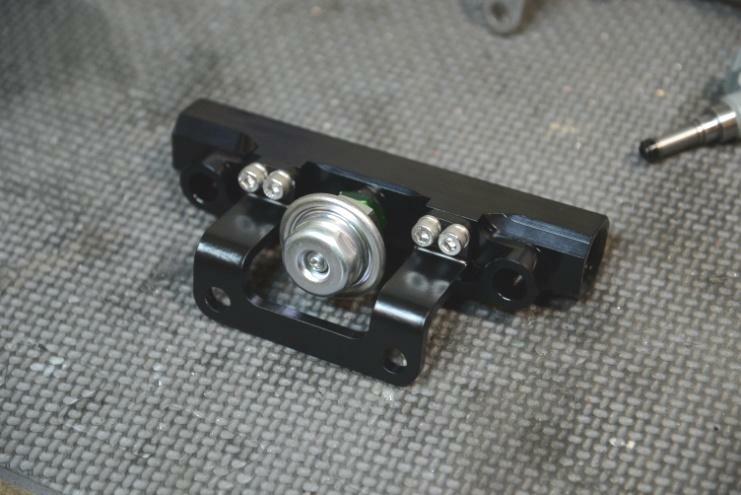 When tightening the B-nut, hold the fuel rail with a large adjustable wrench (or similar) to keep from bending the fuel rail mounting bracket. 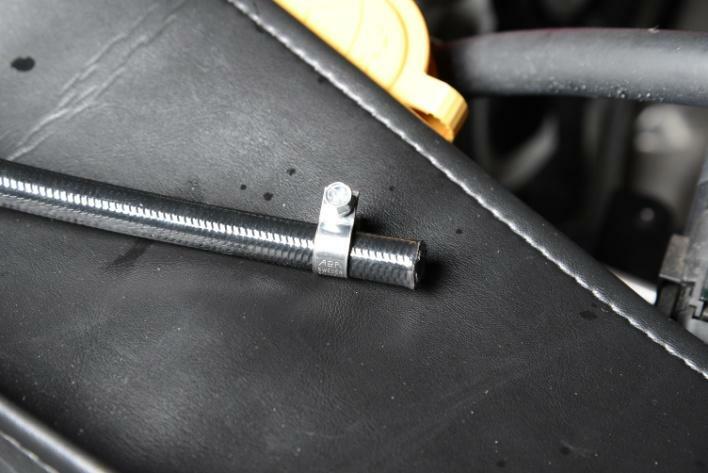 Use a rag or similar padding to keep the adjustable wrench from scratching the fuel rail. Once the hose is tightened on the fuel rail, you can now tighten the hose clamp from step 21 using a 7mm nut driver or socket. 23. On the opposite side of the engine, remove the two M8 mounting bolts holding the steel fuel rail cover in place. 24. Unclip the electrical harnesses from the cover. 25. 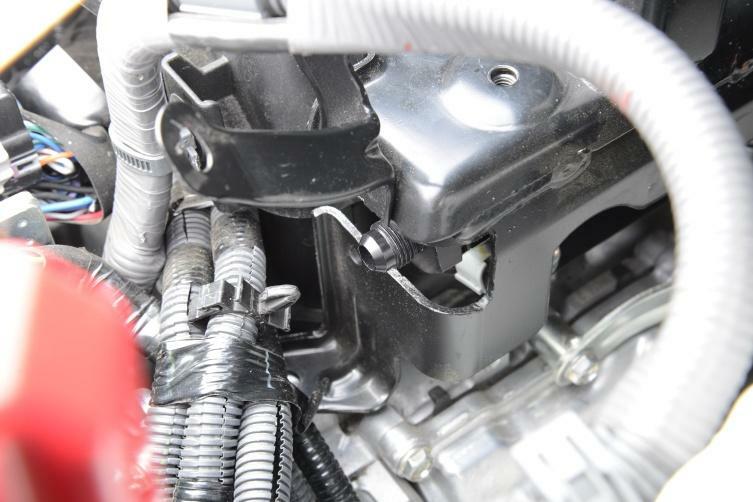 Remove the three M6 bolts holding the ECU to the brackets. Set the ECU aside (it is not necessary to unplug in). Carefully remove the black metal cover and set aside. 26. 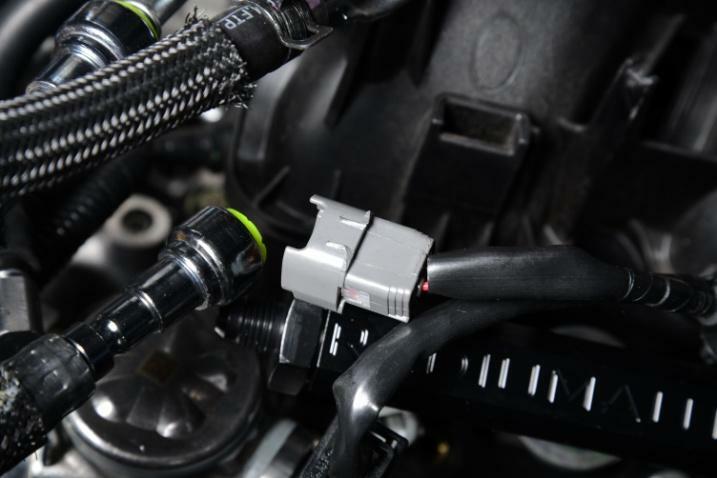 Unplug the electrical connectors for the two fuel injectors. 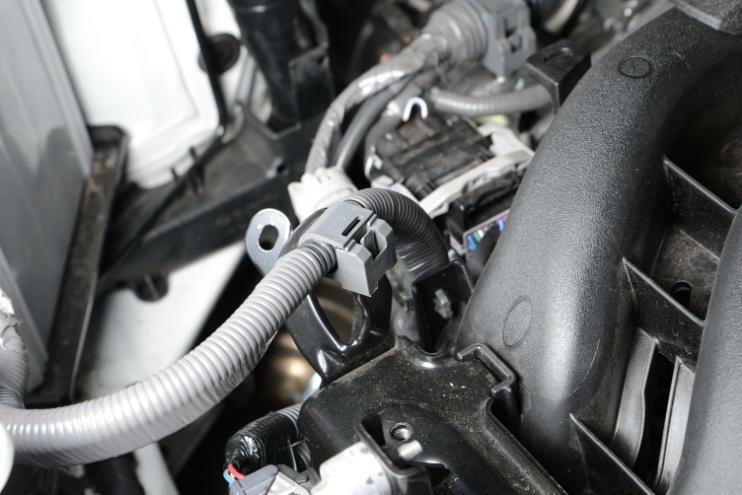 Unlock the fuel cross-over hose by pulling out on the blue clip. Disconnect this hose from the fuel rail pipe. 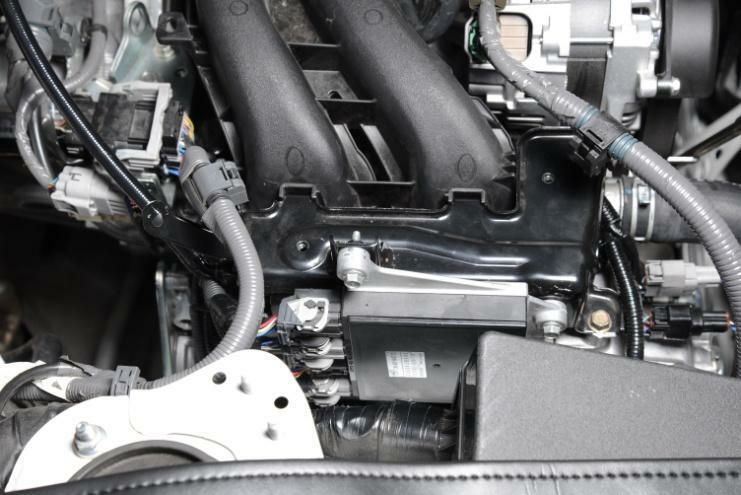 Remove the two M8 fuel rail mounting bolts and remove the fuel rail from the engine bay. 27. Prepare the Radium fuel rail by installing the injectors and pulse damper using the same procedure as shown in steps 7 through 12. Install a -6AN adapter in the rear port and the included port plug in the front port of the fuel rail. 28. Install the fuel rail in place and reuse the factory M8 bolts in the mounting bracket. 29. The black metal cover needs to be reused to provide mounting for the ECU. Modify it by cutting a large slot to clear the end fitting of the Radium fuel rail. This may take several test fitting iterations. CAUTION: Do not cut metal or create sparks near open fuel lines and gasoline. 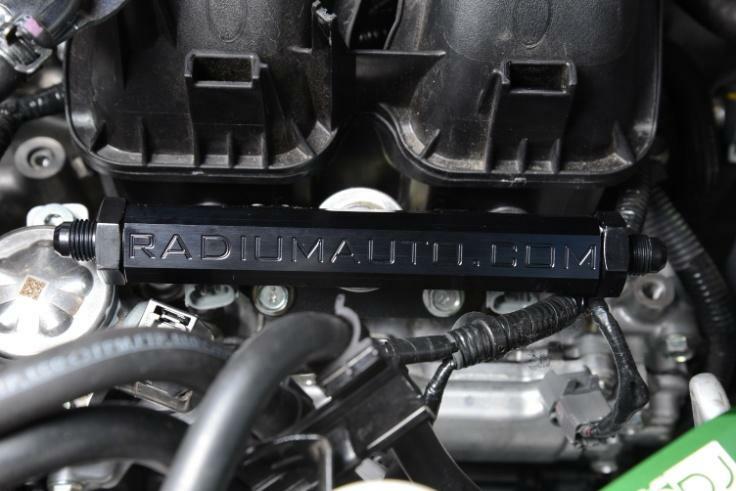 NOTE: Modification of this cover is not required if an alternative method for mounting the ECU is found. 30. This picture shows the clearance slot around the end fitting of the fuel rail. When the slot is complete, deburr the edges with a file and apply paint to the exposed metal of the cut area. 31. 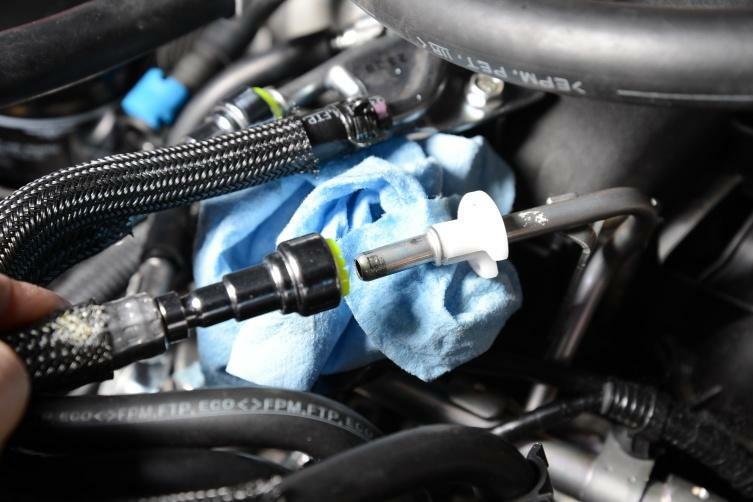 Before installing the metal cover, clip the ears off of the injector connect (as performed in steps 14-16) for the rear injector connector on the RH side. 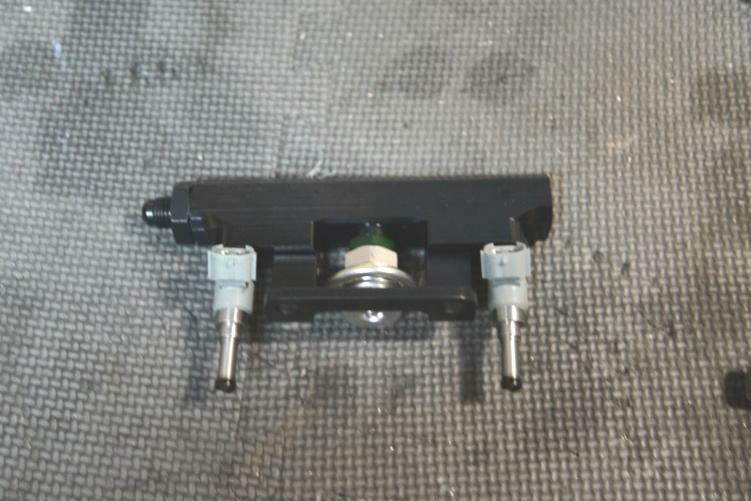 This will allow the injector to rotate in place enough to clear the metal cover. Plug in both injector electrical connectors. 32. 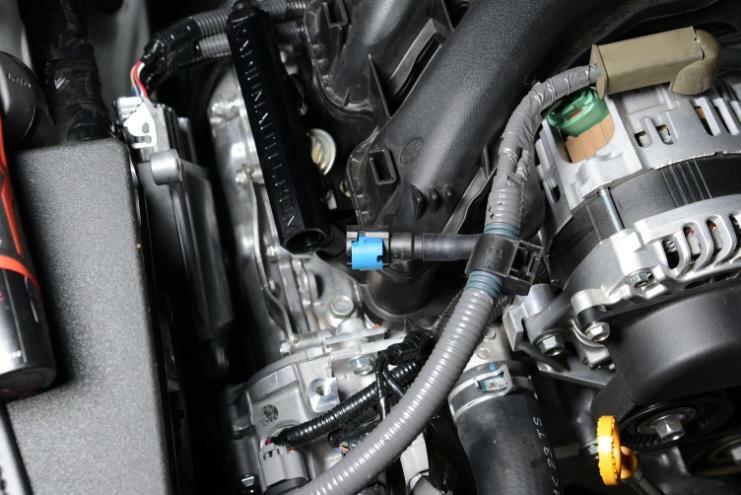 Before installing metal cover, connect the PTFE -6AN hose included in the kit to the end ports of the fuel rails. 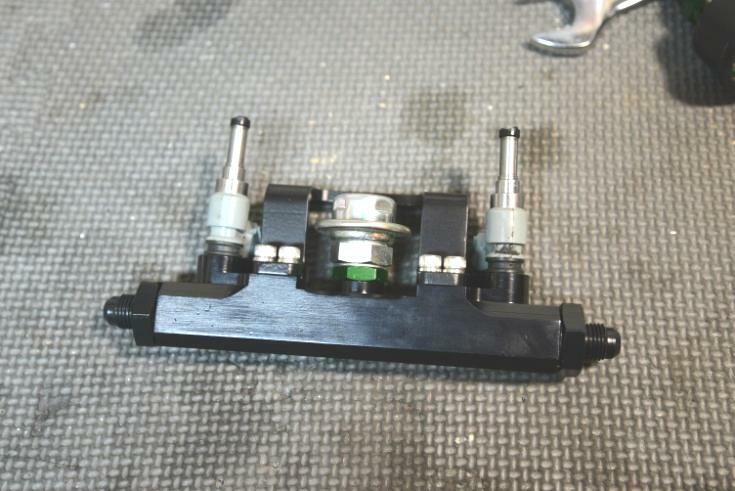 The 45 degree fitting end connects to the RH fuel rail, and the 90 degree fitting end connects to the LH fuel rail. Hold rails while tightening hose ends to the fittings to prevent bending the fuel rail mounting brackets. 33. Install the metal cover and reuse the factory bolts to secure it in place. Reattach the wiring harness clips. 34. Reinstall the ECU to its mounting brackets. 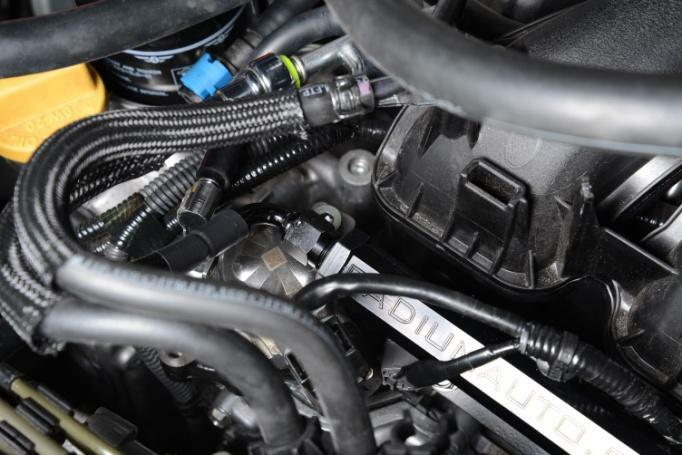 Note: The factory fuel crossover hose may be removed from the engine bay. 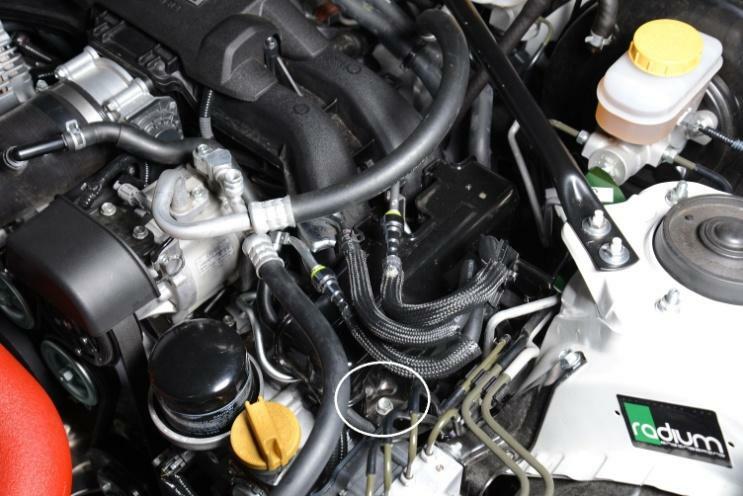 It is clipped in one spot to the underside of the intake manifold, but can be released without removal of intake manifold or throttle body. 35. Key-on the ignition to allow the fuel pump to prime. Do this several times. Check for leaks. Attempt to start the car; it may take longer than usual to start because air is being bled out of the fuel system. Once started, check again for leaks.